TMZ’s Leslie Harris talks about the American Idol Finale and result, along with reaction from judge Randy Jackson. 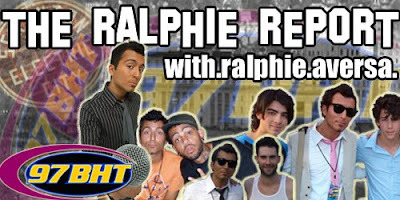 Chris Daughtry calls up The Ralphie Radio Show to chat about his new single/CD, a possible tour, and this season of American Idol – and he isn’t pleased with the favortism shown to Idol finalist Adam Lambert. Read Ralphie’s exclusive report on Chris’s Idol criticism here. Leave This Town drops July 14. You might be able to count Chris Daughtry among those surprised that Kris Allen won American Idol last week. In a pre-taped interview on “The Ralphie Radio Show”, Daughtry seemed baffled at the amount of media attention and bias directed toward Idol contestant Adam Lambert. A question regarding Katy Perry’s outright support of Lambert, with Adam’s name embroidered on her cape, elicited the comment. TMZ reported Idol producers edited out this detail when the performance posted to iTunes and the Internet. The American Idol Season 5 alum concurred with my assessment that the media already anointed Lambert this year’s winner, albeit prematurely. Although I admitted to Chris that my coverage of “Idol” is limited, I feel as if the media covered Lambert as if it assumed he already won. “It’s kind of like Adam has already been crowned the winner, and everybody’s just kind of going along with that,” I commented to Chris. The North Carolina rocker’s band just released a song to radio, “No Surprise”, with a new LP, “Leave This Town”, out on July 14. Daughtry, who performed the new track on Idol, noted that all the finalists seemed like great people, but he could relate to Allen on a number of different levels. Allen didn’t ask Daughtry for any advice, but that doesn’t mean he didn’t receive any. Words of wisdom from an Idol contestant who didn’t have the luxury of on stage endorsements or an Idol crown – yet went on to drop a debut LP that sold over six million copies. Daughtry assures fans that the band didn’t deviate from its trademark sound, but did test some new sounds on the one CD – likening one track to something that would draw out glow sticks if Timbaland got a hold of it. Daughtry’s band is in the planning stages of a tour that would kick off this fall, in support of the new album. In a pre-taped interview that will air tonight on “The Ralphie Radio Show”, Chris Daughtry seemed baffled at the amount of media attention and bias directed toward American Idol contestant Adam Lambert. The American Idol Season 5 alum concurred with my assessment that the media already anointed Lambert this year’s winner. Although I admitted to Chris that my coverage of “Idol” is limited, I feel as if the media is covering Lambert as if it is assumed that he already won. The interview, in its entirety, will be posted later tonight.